The weekend is so close you can practically taste it. Here are the edible events going on in the next few days to keep you occupied — and sated, for that matter. Cookies and Fallen Fruit Happy Hour: Remember those guys called Fancy Boyz whose cookies we were swooning over? Well, they&apos;ll be presenting an event called Fruit Cake at the Fallen Fruit FRUITIQUE! happy hour this Saturday from 4:00pm - 8:00p.m. In addition to good eats and conversation, there&apos;ll be tunes provided by DJ Heather Mccullough. The event is part of the Hammer Museum‘s LA2050 project, Arts ReStore LA. You can find out more info here. Santa Pub Crawl in Santa Monica: Each year, Christmas enthusiasts gather in their finest Santa gear to raise funds for the Westside Food Bank, and raise glasses full of holiday cheer. (And grog, of course.) Last year 5,000 Santas came out, and this year will be an equally festive fete with 30 bars and restaurants participating. They&apos;ll be offering discount snacks and drinks to everyone wearing an SMPC wristband. Saturday&apos;s event starts at 5 p.m. at Rusty&apos;s Surf Ranch. Tickets are $10 in advance, $15 on the day of. You can find out more info about the Santa Pub Crawl here. 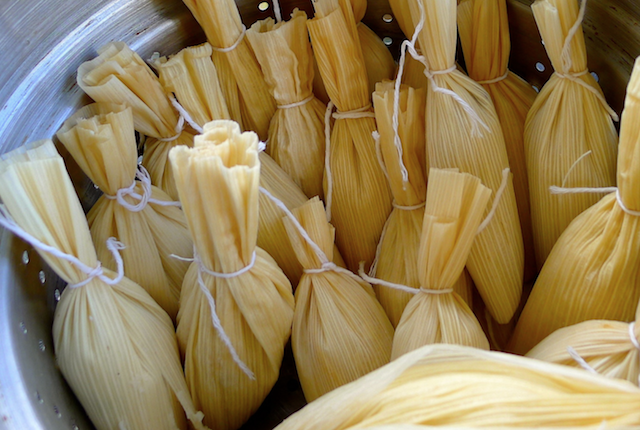 Taste of Tamales Festival: Tamales are an absolute essential when it comes to holiday cooking, especially here in SoCal, so it&apos;s only natural that a city that has as much love for masa as L.A. would celebrate with a festival dedicated to these little packages of joy. On Sunday, Placita Olvera will host The Taste of Tamales food festival, which anticipates over 20,000 people this year. There&apos;ll be tamales of all shapes and sizes and stuffings, including meat, cheese, fruit, and hot chilies. There&apos;ll also be live music, craft booths, carnival games and a toy giveaway for the first 10,000 kids to show up. The festival is free and goes from 10 a.m.-6 p.m. You can find out more information here.